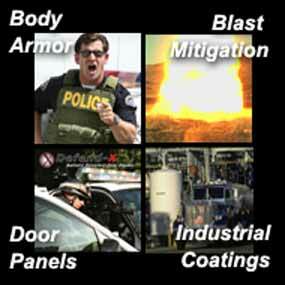 DefensTech International, Inc, (DTI) is a leader and innovator in the manufacturing of new technologies for ballistic armoring for structures, vehicles and personnel, as well as patented technologies to optimize blast mitigation to defeat terrorist explosive devices. DTI was founded based on the need for lifesaving trauma plates that were capable of defeating multiple rounds and ballistic car door panels for law enforcement, laying the foundation for DefensTech’s ever-broadening capabilities. Our corporate motto and mission is: “Protecting Those Who Protect and Serve”. Defend-X® Mobile Application Rigs, available only through DefensTech International Inc., are turn key systems with everything you need to be job-site ready. Our team of highly skilled application professionals will train you and your staff to be experts in the patented Defend-X® Blast mitigation application process.